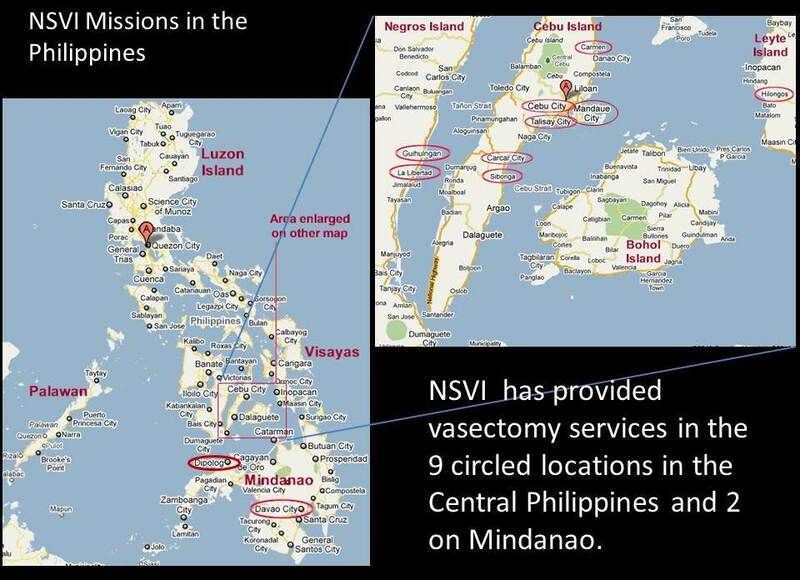 Philippines | No-Scalpel Vasectomy International, Inc. The Philippines is a nation of 7,000 islands with a collective land area similar to that of the state of Arizona. But with about 110,000,000 inhabitants (nearly 1/3 the population of the United States), it is a very crowded archipelago, with a population density roughly 10 times that of the United States (313 persons per sq km vs. 32 persons per sq km). View Philippines in a larger and more interactive Google map. View where we work in a larger map. Since our NSVI founders are from the Visayas region where they have established connections, this central region has been the site of most NSVI missions to date. The Visayas region is the group of islands in the center of the country between the larger islands of Luzon to the north and Mindanao to the south. Cebu City is the second largest city in the Philippines (after Manila, indicated by the A teardrop) and the cultural and financial center of the Visayas region. In 2017, after 15 years of missions to the Central Philippines, NSVI began to sponsor annual missions to Manila. See the history of NSVI missions over the past decade by clicking the links to the right. NSVI also supports Domestic Teams in both Cebu and Manila. Please note: NSVI is very appreciative on the help we get from the Bisaya Medical Association (BMA), a group of Filipino-American doctors originally from the Visayas region, who conduct medical/surgical missions to the Philippines every February. The BMA takes care of our licensing requirements so that we can conduct NSVI missions in conjunction those of the BMA.